Train global talents who are able to guide future enterprise development with innovative mentality, high responsibilities. Academic and commercial application is perfectly used in the EMBA courses of Executive School of University of Liège. The advantages of the courser lie not only in deep analysis on the various complicated areas in commercial organizations, but also providing actual solutions to all departments with frequently interests conflicts in the commercial organization. The course contents are challenging with abundant academic materials combination, including video materials, cases, projects for study and other methods, which aims to strengthen the understanding of commercial organization and mastery of solution to the problems. The course are suitable for the executive mangers and decision makers who are willing to implement leadership, supervision and operation, and grant the students abilities to completely control a commercial organization. 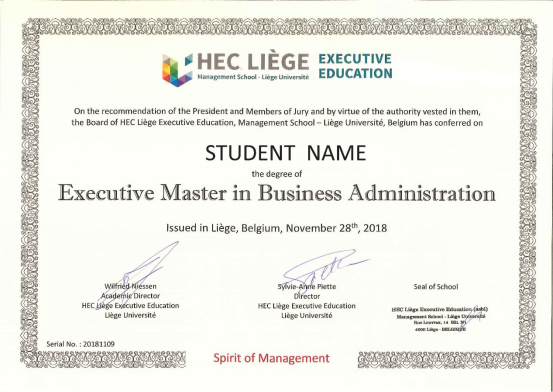 Executive School of University of Liège will providing the course, asses and award EMBA certificate with strict academic requirements. The degree certificate has been widely recognized worldwide. Executive School of University of Liège welcome international students and their relatives to attend the annual ceremony for overseas EMBA graduation and EMBA certificate awarding in the headquarter of the university in Sept – Dec every year. The students are required to write the graduation paper and complete thesis defense according to the requirement and guidance of local teaching institute. Graduation thesis required 20000（±2000）, which should be translated into English and submitted to the university after passing the thesis defense. University of Liège welcome qualified candidates regardless gender, age, culture, nationality, religion and without racial discrimination. Minimum admission requirements are set by the university to decide the admission in terms highest education, academic potential, creativity, social & moral values and English proficiency. University undergraduate and bachelor degree, graduated from internationally accepted academic institutes, college and university, with at least 5-year experience for middle and high level management. Or: admission will be granted to applicants who only have degrees of internationally accepted academic institutes, college and university with at least 5-year experience for middle level management, according to the actual conditions. The notice of admission will be sent within 2 weeks after the application is accepted. Great amount times are needed to complete the regulated courses and requirements from the admission date. It usually takes 18 months to complete the course and thesis before obtain the academic certificate finally. The courses will be given monthly in weekends every other week, and actual arrangement will be followed in case the courses change. The opening day of this term of EMBA class of University of Liège will be in April 2019, and the teaching project is planned to end in Sept, 2021.